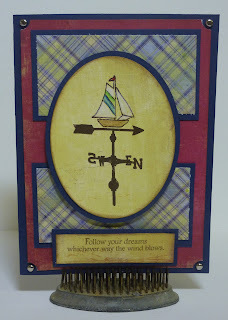 This week's Die Cuttin' Divas challenge was to use a sketch. I used the George and Basic Shapes cart to cut an oval slightly bigger than the largest Spellbinder oval die that I used. The stamped images are from Iron Gate Stamps' Weathervane set. I used water color crayons to color in the sail boat. 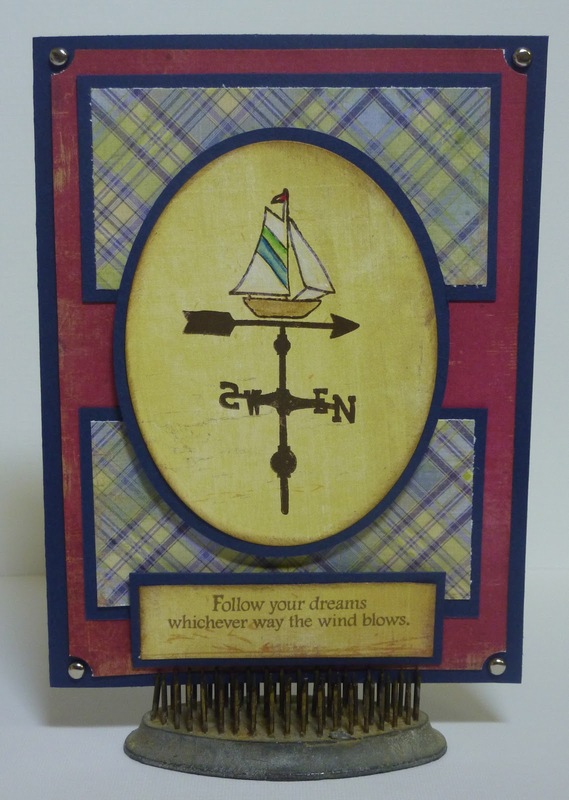 The patterned paper is from Fancy Pants Designs Beach Bum stack. Great take on the sketch! Beautiful card. What a fabulous card!! You did a great job on the sketch!! Awesome card! Loving the colors you used and I sure wish I was relaxing on the boat. Thanks for joining Die Cuttin' Diva this week for our sketch challenge. Great take of the sketch!! Thank you for joining our DCD sketch challenge. Tammy! I love your use of the weathervane!! Thank you so much! Happy Day to you! Awesome job on your take of the sketch!Great work! Thanks for joining us at DCD. Your card is lovely! Plaid always seems appropriate for a masculine card and the deep colours look great.